The Scottish government is facing a battle to pass its budget plans for next year after talks with two of its most likely partners stalled. The Liberal Democrats pulled out of talks after the government refused to "take independence off the table". The Scottish Greens said if they were to back the budget the government would need to show a "meaningful" commitment to reforming council tax. The finance secretary said he would hold more talks "in the weeks ahead". 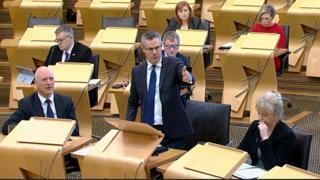 Derek Mackay - who will present his draft budget to Holyrood on Wednesday - insisted that his proposed tax and spending proposals for 2019-20 would "protect vital public services and prioritise spending on health, education and economic investment". The minority SNP government needs the support of at least one other party if it is to pass its budget. It is due to publish its plans on Wednesday - with the prospect of a deal with either the Scottish Conservatives or Scottish Labour extremely unlikely. Image caption Willie Rennie said his party would not back the budget unless the Scottish government ditched plans for an independence referendum. Scottish Lib Dem leader Willie Rennie said he had met Mr Mackay and Public Finance Minister Kate Forbes on two occasions "to explore what could be done" with the budget. Mr Rennie said his party had been willing to "step in to help address the problems that have been mounting since the SNP came to power 11 years ago". But he said the talks ended when the SNP politicians "could not agree to even a short cessation in their independence campaign". Mr Rennie added: "That was unacceptable to us. The SNP's own Growth Commission admits that their plans will see us poorer after breaking up. Public services will be hit. "Breaking up is hard to do. The lessons of Brexit are the lessons for independence, so it is disappointing that the Scottish government won't learn and set aside their independence plans." He claimed the Scottish government was now "stuck with the Greens and are at their mercy", which he predicted would "cause problems for important Scottish industries in north east Scotland and see big tax rises". However, Derek Mackay said his budget would focus on protecting Scotland from the worst effects of Brexit. He said: "Our policies have already ensured that Scotland benefits from quality public services and our progressive reforms to income tax have protected those on the lowest incomes." While Mr Mackay cited the UK's exit from the European Union as continuing to be the "biggest threat to Scotland's prosperity", he insisted his proposals would "not be defined" by this. Instead, he said the budget "will set out how we help protect Scotland as far as we can from the damaging uncertainty of the UK government's Brexit policy". The previous two Scottish budgets have been passed with the support of the pro-independence Scottish Greens, who have been holding informal discussions with the government ahead of this year's budget and are seen as the most likely partners. But the party has warned its "precondition" for entering formal budget talks has not yet been met just days before the budget is published. Scottish Greens co-convener Patrick Harvie said the SNP had agreed with his party, Labour and the Lib Dems three years ago that "the present system of council tax must end". He added: "If they are unwilling to recommit to that policy and start working on making that pledge a reality, then they will be choosing to close off any chance of reaching a budget agreement with the Greens." Mr Harvie said: "Scotland's system of funding our vital local services is broken, and we urgently need the reforms which almost every party agreed to before the last election. Since then the government has stalled, and this cannot be allowed to go on. "As MSPs we have been given a clear instruction from our party members that we can only enter formal budget negotiations if there is meaningful progress on local tax reform to make a fairer system that protects services and cuts inequality. "Replacing council tax with a fairer alternative can't happen overnight, but the work must begin now." However, Mr Harvie stressed that his party would "still be ready to talk" if the government was willing to change its position. Meanwhile, the Scottish Conservatives have urged Mr Mackay to rule out any tax rises in the budget, arguing that "the SNP has made Scotland the highest taxed part of the UK for businesses and people, and yet people are still waiting months for cancer diagnoses." And Scottish Labour has called for a budget that "delivers real change" by stopping cuts to council budgets, freezing rail fares and increasing child benefit by £5 a week. The Scottish government has an annual budget of about £33bn. Last year's budget included major changes to Scotland's income tax rates and bands, which saw middle and high earners pay more and lower earners pay less.